Naval Enna Jewel shows you a story, which you should have heard somewhere down the lane. In fact, Keralites could easily connect with this particular story, since the state has contributed the most in terms of the migrants from Indian continent to gulf countries. How does it feel like fighting against all odds from the perspective of a woman, to be precise a mother with a daughter to look after! If you count the social situation, where all these take place, then Naval’s story definitely deserves a special mention. 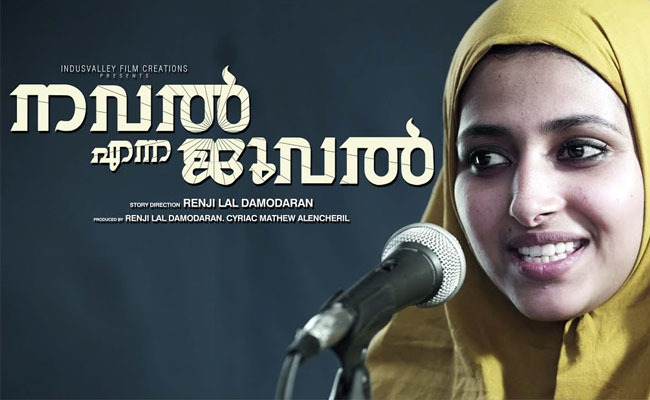 Being a girl, victimized of marrying off to an old Arab in her teens, Asma (Anu Sithara / Shwetha Menon) was always cautious of her adverse conditions in a land, where she is an alien. Widowed and having a baby girl besides her, Asma was forced to go for a tough fight with life. Now into the present scenario, we see Asma’s daughter Naval (Reem Kadem), sentenced to death for the grave crimes committed by her. Now, ‘Naval Enna Jewel’ is the journey, which takes you through the hardships which came across the lives of both Asma and Naval, and how those circumstances landed Naval in jail. Now, see ‘Naval Enna Jewel’ has got a great plot, which has not been explored much in Malayalam cinema. Yes, we have our share of a ‘Gadhama’ here, but this one is entirely different. Tinged with some sort of fancy, the story of this Arindam Sil directorial could have well been made a gripping thriller. But, the sad part is that makers haven’t tried to excommunicate the overtly dramatic features. Well, death is something that is inevitable and could feeble even the bravest. While some would accept its inevitableness, others prefer mourning over it. Yet another section would go for coiling philosophical tales. In ‘Naval Enna Jewel’, the third section outnumbers the other two categories – resulting in the movie delivering a different purpose, that which it intended to be. Yes, it is a fact that women face a lot of problems in real world – especially the marginalized ones like that of Asma or Naval. But, if you plan to take a documentary on all those struggles, then it could well water the very purpose of taking a movie targeted to reach public. That is why even backed with some striking performances, ‘Naval Enna Jewel’ lags like a crippled horse, which well falls behind the finishing line. That said, Shwetha’s transformation to a man’s outfit will really leave a mark of the kind of hard work put in by the costume designing department. Setting aside those clichéd melodramatic moments, the performance from the lead cast were all satisfying enough to tell a convincing tale. Be it Shwetha Menon, or Reem Kadem – both have excelled in their parts. Others, though accounted for a short frame period, like Karamana Sudheer, or Anu Sithara, Adil Hussain and to name the rest, have all done justice to their potentials. Technical department too delivered a good effort in building the frame of this movie. Music too served the purpose. But, at the end, ‘Naval Enna Jewel’ is destined to be enlisted with the movies, which have underutilized the potentials of its story.